Tankless type water heaters have become increasingly popular over the years. This is because they are the perfect option for small properties or storage areas that don’t have enough room for traditional larger sized water heaters. Another added benefit of a tankless unit is that some homeowners are able to install them on their own. Therefore, they don’t need to worry about the extra cost of hiring professional plumbers and electricians if they don’t have to. One such reliable product is the Noritz Tankless Water Heater. When you invest in this product, you’ll have the on demand hot water you need it. This brand offers an affordable and efficient model for your residential or small commercial property without the responsibility of a large and bulky tank. As mentioned, the main mission behind all tankless water heaters is to give homeowners the ability to have instant hot water while taking up far less space than traditional water heaters. The Noritz Water Heater is no different as this unit has several features designed for easy use and high performance. This is especially true when compared to some of the lower-end tankless units. With the ability to give you access to water between 100 and 140 degrees Fahrenheit, you’ll have the benefit of never running out of hot water, especially if you don’t usually consume a lot of hot water at home. There are plenty of other advantages to the Noritz brand ranging from its high-efficiency build to an impressive flow rate, which we will discuss below. Even though this water heater is designed to be easier to install, it’s not recommended for inexperienced homeowners. This because there are a few different types of hook-ups that you’ll have to pay close attention to. With that being said, as it’s easier for professionals to install, so you’ll save on installation costs. Who Is This Noritz Water Heater For? The main group of people to benefit from using the Noritz tankless is individuals looking for a solution to heated water away from traditional models. Not only are these models tankless but they are usually less expensive than their larger counterparts. Plus customers report they’re also easier to install. This makes them a more cost-effective option. This product is a great option for people who own a small rental property. Alternatively, it is also ideal when looking for a way to cut back on the costs of running a home. A tankless water heater can also be beneficial for smaller commercial properties. It provides an adequate water supply for a personal office that uses less hot water than a four-bedroom home. Again, it’s very cost-effective and easy to mount absolutely anywhere on your property. As a result, you have access to constant hot water on a manageable budget. Unlike most other hot water tanks that you’ll find on the market, especially ones as small as the Noritz, you’ll never have to worry about running out of hot water ever again. It’s important that you pay close attention to the size of the home that is recommended for your water heater. This is to ensure you choose the perfect size per square footage. 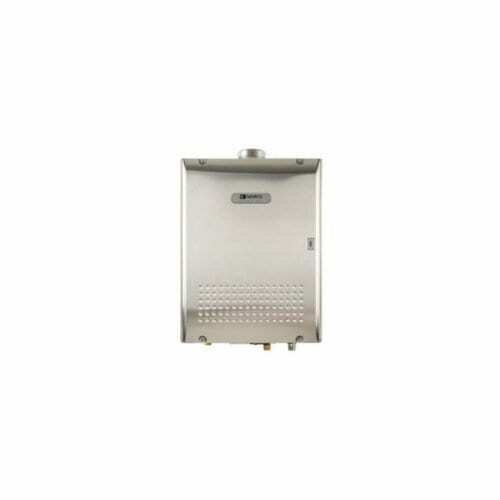 For small to medium properties, this water heater will give you an endless supply of hot water. Another concern of homeowners when it comes to tankless heaters is that their flow rates are often inferior when compared to larger units. To make tankless type more competitive, the Noritz has been designed with an impressive high flow rate. This helps to make sure that you get a reasonable amount of water pressure suitable for everyday use. At times, water heaters are to be installed either inside or outside. However, this particular model can be installed both indoors and outdoors. This makes it conveniently fit in with your space and personal preferences. Additionally, it can be placed where your gas and electricity hook-ups are located. New devices especially are meant to cut back on energy consumption. It can, therefore, be quite frustrating to discover that is not the case when you receive your monthly bills. Not only do all tankless types reduce the amount of energy used to heat water, but the Noritz unit is specifically designed to be even more efficient. What does this mean? Well, not only will you save on the money you put into buying and installing this new heater, but you’ll also save on heating the water. An added benefit to the Noritz tankless water heater is that it’s entirely controlled by electricity. As a result, you won’t have to worry about dealing with gas ignition. Also, the external electronic control pad provides an added advantage by allowing you to manually adjust the temperature of the water to your desired level. In the same token, due to the absence of gas, this is a safer unit to have in your home. Remember to place it out of reach of children and pets though. Also, the water heater must be connected on its own dedicated 110-volt outlet for the controls to operate effectively. Measuring in at 17 x 12 x 29 inches, the Noritz Tankless Water Heater is incredibly compact. Ultimately making it perfect for storing in absolutely any room in your home. No need to worry about rearranging appliances or finding a dedicated space in a storage room. The fact that the water heater can be installed relatively anywhere is definitely a drawcard for this model. People who haven’t used tankless water heaters before underestimate how much hot water they have access to. It is no different for this model. With a temperature range of 100 to 140 degrees Fahrenheit, control over the heat level in your home is easy. Before you start the installation process, it is recommended that you thoroughly read through the instructions. This is to determine if you have the right skill set and tools to install the water heater properly. Although tankless heaters are easy to install it needs its own dedicated outlet. Therefore the advice of a professional is advised. Moreover, you will also want to take a brief read-through of the warranty before installing. This is because some companies will void the terms unless a professional installs the unit. This would include verifying all parts needed, troubleshooting and possible installation problems you might run into. Aside from these recommendations, learning how to use the Noritz Water Heater is simple once it is installed. On the exterior of the device, you’ll find that there is a digital remote control. This enables you to adjust the temperature, check on any indicator lights, and ensure that the water heater is performing to the best of its ability. Due to the fact that tankless water heaters are at times far more preferable than their traditional counterparts, you can guarantee that there are plenty of models available on the market. When compared to the Noritz Tankless Water Heater, we’d also recommend taking a look at the Takagi Tankless Water Heater. Price: First and foremost, the Takagi model is half the price of the Noritz, which may make it a preferable option for homeowners on a budget. With that being said, the Noritz has a capacity of 10 gallons, whereas the Takagi only offers 6.6 gallons. This is a large difference for regular sized homes. Temperature Monitoring: The Takagi water heater offers consistent temperature monitoring to ensure that your water heater is putting out the best level of heat possible, even in colder temperatures. Apart from those two differences, both units give you the same benefits that you would get from a traditional tankless water heater. Then again, the Takagi heater can only be installed indoors, while the Noritz can be installed either inside or outside, depending on your preferences. If you’re a first-time homeowner and you’re looking into the advantages and benefits of using a tankless model, the Noritz tankless water heater is a great model to take into consideration. It’s designed with superior attention to detail, surprising affordable, efficient and is recommended for homes with one to two showers. The most important thing to know about this water heater is that it will take a little bit of know-how in terms of installation. This is because you’ll not only have to focus on water and electrical hook-ups, but you will also need to know where your natural gas hook-ups are. It’s always recommended that you seek the assistance of a professional plumber to ensure that your water heater is installed properly and safely. With its high level of performance, this Nortiz water heater can be a great option for homeowners who are transitioning from traditional tank heaters to a unit that is more energy-efficient and affordable. It has plenty of advantages, such as an external electronic control and a very versatile size. Additionally, the ability to be installed both indoors and outdoors means that you’ll never transition back to a tank water heater again.